With the kids out of school for the holiday break, you may be looking for activities to keep them busy. Popsicle sticks can provide hours of fun crafting for you and your family. Plus, they are easy to find and inexpensive. Using the sticks along with other basic supplies like paint, glue, little pom-poms, glitter and googly eyes, you and your kids can make fun decorations and gifts for the holidays. 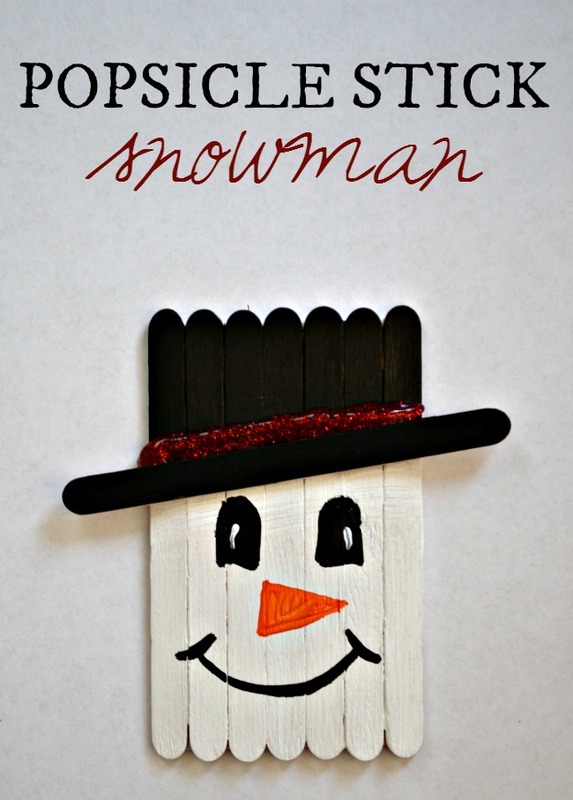 For this fun decoration, cut a piece of cardstock or cardboard that will fit 7 popsicle sticks. Glue the sticks to it. Let it dry. Paint 2/3 white and 1/3 black. Paint one more stick black for the hat rim. Let dry. Glue the hat rim onto the snowman. With sharpies or paint, add the face. Decorate the hat with paint or glitter glue. You can add a magnet to the back so you can display it on your refrigerator or glue a ribbon loop to the back so you can hang it up. 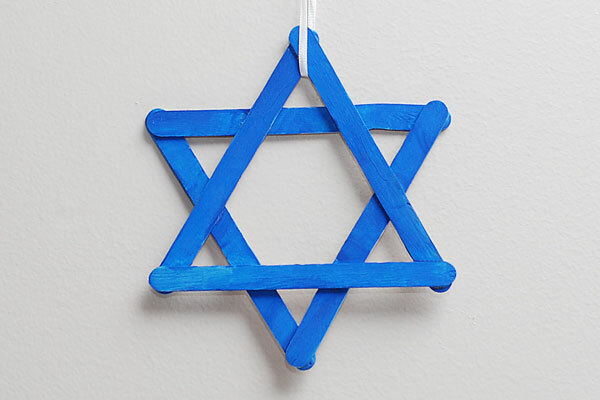 This festive Jewish symbol can be made simply with 6 popsicle sticks. Glue together 2 triangles and then glue those together. Let it dry before painting it with a color of your choice. You can even add glitter or embellish with another color of paint. Add a string so you can hang it up. Santa’s reindeer are a big part of the Christmas season. Glue together 3 popsicle sticks. With the horizontal stick, don’t glue it right at the corners. Be sure to leave a little room for the antlers. Let it dry. Then add a red pom-pom nose and googly eyes. For the antlers, wrap a brown pipe cleaner around the end and curl it. Add a string to make it an ornament. 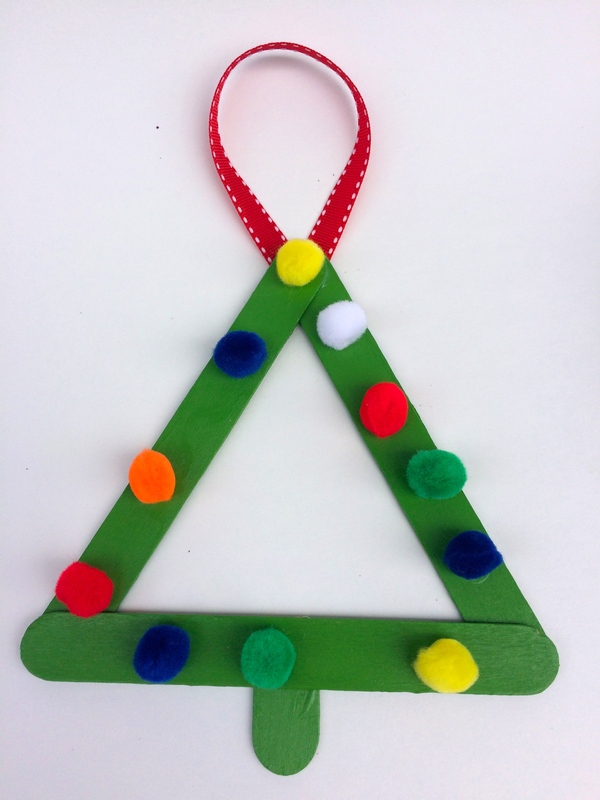 This adorable decoration is easy for all ages to make. You will need 3 full sticks and 1 piece about an inch long cut from a full stick. Paint the popsicle sticks green. Let them paint dry. Next you will glue the 3 full pieces together into the shape of a triangle; then add the trunk on the bottom. Let it dry. Time to decorate the tree with pom-poms, sequins, glitter or other fun items. Add a small piece of ribbon at the top to make it an ornament. 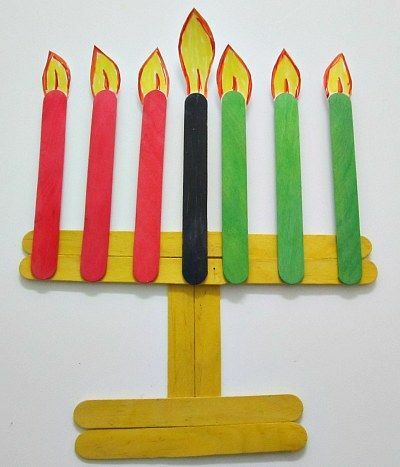 If your family celebrates Kwanza, you can make this Kinara representing the seven principles of the holiday. You will need 13 popsicle sticks. Paint 6 yellow; 3 red; 3 green and 1 black. While the paint dries, cut 7 small flames from yellow paper. Glue the sticks together in the shape of the Kinara. If you want to hang it up, glue a string loop on the end of the black candle. 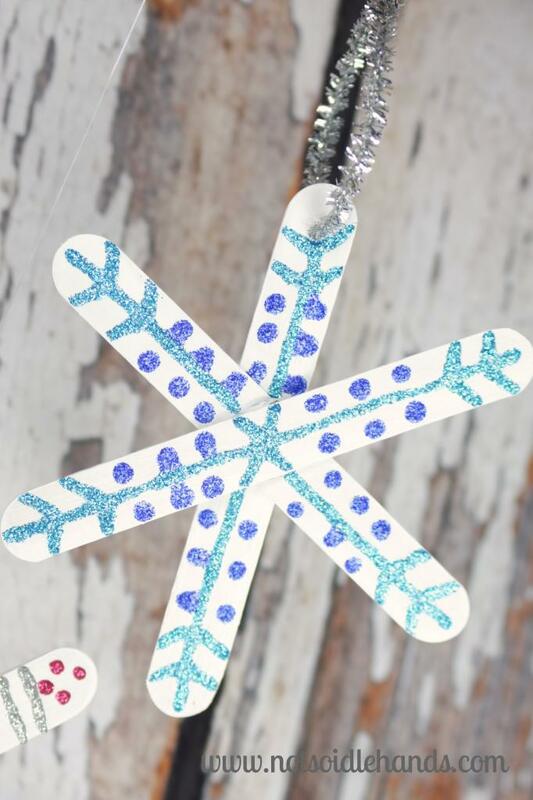 These fun snowflakes can provide festive decorations all winter. To make different sized ones, get a variety of popsicle stick sizes. Paint the sticks white. Let dry. Glue the 3 sticks together in the center. Let dry. Decorate with different colors of glitter glue. Glue a ribbon or yarn loop on the end of one stick so you can hang up your creation. Enjoy creating these simple crafts and the time you are spending with your family making festive decorations and wonderful memories.